In the beginning, the world is spoken into existence with one word: "Earth." There are no inhabitants, and no sun--only the broad sky, silent sea, and sovereign Framer and Shaper. Then come the twin heroes Hunahpu and Xbalanque. Wielding blowguns, they begin a journey to hell and back, ready to confront the folly of false deities as well as death itself, in service to the world and to humanity. This is the story of the Mayan Popol Vuh, "the book of the woven mat," one of the only epics indigenous to the Americas. 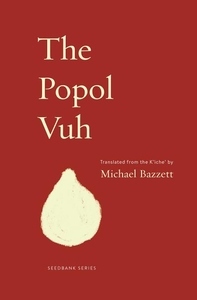 Originally sung and chanted, before being translated into prose--and now, for the first time, translated back into verse by Michael Bazzett--this is a story of the generative power of language. A story that asks not only Where did you come from? but How might you live again? A story that, for the first time in English, lives fully as "the phonetic rendering of a living pulse."